CO 2 : 0 ~ 6,000 ppm range, Diffusion sampling mode. 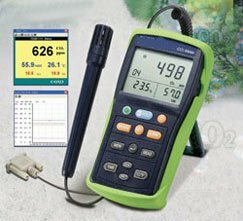 Three LCD Display for CO 2 , %RH Humidity and Air Temperature. Maintenance free dual wavelength NDIR infrared CO 2 sensor (non-dispersive infrared). Continuous or manual data logging (20,000 sets). Data hold & Maximum / Minimum with Time stamp. 6pcs size AAA Alkaline Battery (large current) batteries.